Torquay United striker Lloyd Macklin has joined Blue Square Bet Premier side Hereford United for a two-match trial. 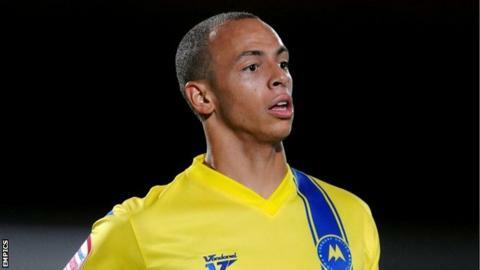 Macklin, 22, is currently on a contract tieing him to Plainmoor until 2013. But, although he has played just 18 times since arriving in February 2010, he featured just twice last season and was transfer listed in May after a spell on loan at non-league Salisbury. Until Bulls manager Martin Foyle showed interest, Gulls boss Martin Ling had received no inquiries about Macklin. "Hereford have come in for him and he'll play two games for them," Ling told BBC Radio Devon. "Martin Foyle spoke to me and I said they were more than welcome to look at him, but it doesn't mean that we might not see Lloyd back here. "He signed a three-year contract when he came here and he's still on the back of that three-year contract. "He needs a reality check if I'm honest, in life and in football. "He was a first team player at Swindon at the age of 16 and I just see the same product as they saw at 16, someone who might be a player and has got all of the credentials. "But the problem's with Lloyd, not with the people that work with him." Hereford launch their pre-season campaign with a home game against Yeovil on Saturday (14 July, 15:00 BST), followed by short trips to non-league Evesham (17 July, 19:45 BST) and Worcester City (21 July, 15:00 BST).